Report reaching us from instablog9ja is that a 22-year old lady ripped her mother's womb out because she refused to give her money. 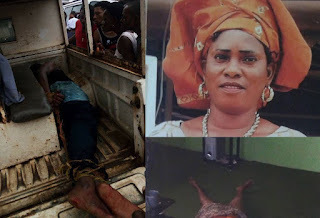 See what instablog9ja are reporting..
On Thursday, 22-year-old final year student of the University of Benin (UNIBEN), identified as Caleb Obasogie, killed his 55-year-old mother, Josephine Igbineweka, by ripping out her womb. The last child was said to have killed his mother for her refusal to give him money. The killing occurred at about 8:00 am at their residence in Benin City. Witnesses said Caleb locked himself and his mother in one of the rooms and used a broken bottle to stab her repeatedly until her intestines and womb were ripped out. He was said to have dangled the intestines and his mother’s womb before neighbours who could rush in to rescue her. Neighbors said the deceased passed the night at a neighbour’s house because her killer-son locked her out for not giving him the money he demanded from her. The late mother was a beer parlour operator in Benin. Some witnesses described the incident as horrible and a scene from a vampire movie. Spokesman of the Edo State Police Command, DSP Moses Nkombe, confirmed the incident and said the son has been arrested by the police.